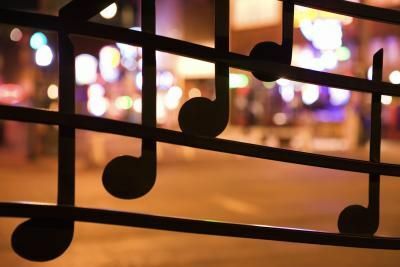 HOW TO USE MUSIC TO IMPROVE MATH SKILLS – Ruth Catchen Reach for the Stars! 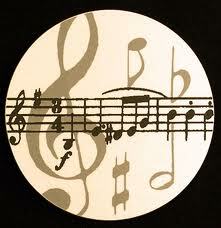 Using music to improve math skills is such an obvious integration of the arts with academics. The fact that many don’t get this seems unbelievable to me. Enough said. Let’s just make it happen. Music is very analytical. It enhances critical thinking. To perform anything you have to do more than two things at once. Many times one has to read notes, sing words, follow a rhythmic pattern and watch a conductor and all with the utmost artistic expression of the sentiment being conveyed. Learning notation in music reading is understanding fractions. The whole note is the whole, half is the half, a quarter is a quarter and on and on. I have used this diagram below as well as a simple pie cut into pieces. Kids get it. If you put the pieces on the floor and let them manipulate them in real life, the idea of fractions becomes real. They understand the space and proportion. Mastering fractions is a problem for students of mathematics instruction. Understand and having facility with fractions is the key to understanding and being able to do higher mathematics. Understanding how to use and manipulate fractions is a consistent problem for English Language Learners. Using music and musical notation as tools has proven to raise mathematical understanding. Using music and its components from an early age sets the stage for mathematical understanding. 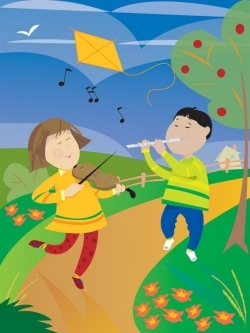 Using music to foster innovation and creativity is ideal for the elementary grades. It can be used with the same concepts for older grades when it is infused with age appropriate activities and skills. Young children thrive from experience. What they can feel or see, they understand. Math and science concepts are no longer abstract. Learning is interesting. The light goes on for children of all learning styles when they make, do, figure out or produce. Students need to get out of their seat, move and make it happen. Through the integration of music, visual arts, physical education and other academics, STEM subjects flourish and are understood. If you feel it, see it, or do it, you will get it. Music is a process that uses skills, learned knowledge, creativity and ingenuity. Assimilating all of these experiences together creates an understanding of Mathematics and STEM curriculum. This experience leads to innovation. Student achievement increases. The results are students who are forward thinking and prepared for the world. In the continuation of the 21st century, inventiveness is needed to progress for the future. Students must use their creativity to become critical thinkers and problem solvers. Integrating music and the arts into the curriculum is a process that uses skills, learned knowledge and ingenuity. Integrating music and the arts with MATHEMATICS and STEM gives results by enhancing student achievement and better preparing students for the world. Produces inquiry based learners who can ask questions, use research and data collection. How does music integrated mathematics instruction relate to the real world? The marriage of STEM/MATHEMATICS and music is a transdisciplinary. These ideas show students how to make sense of the world rather than learning and memorizing isolated bits and pieces of content. Students will learn how to shape an argument and find compelling evidence to support their assertions. This is inquiry-based learning. Students will have discourse and dialogue. Collaboration and teamwork is a part of experiencing and learning. There will be less emphasis on science and math content and more on investigation and analysis. Why and how will be explored. Discovery is the task and students will direct some of their own learning. Students will embark on an adventure to design and pioneer the concepts of math and science. Not “getting it” will not be an option. Integrating music and the arts with Mathematics can and will make a significant difference in how teachers teach and how students learn. This strategy is fundamental to stimulating creativity in students and therefore will shape innovation for our future and for their future. Educators will develop and implement new strategies and content that correlate the fundamentals of dance, drama, and music with math/science learning outcomes in areas such as geometry/spatial relations, number/operations, pattern, measurement, and math reasoning. High quality arts instruction paired with STEM curriculum stimulates creativity and imagination. Students will experience math through music. Music has always been the great equalizer. It doesn’t matter who you are, where you come from or how much money you have. Music demands that you work at it. The arts inspire creativity, self-expression, critical thinking and problem solving. It is an opportunity not only for students to open the door to see how things are made, why things happen, and discover another way to do something, but also to experience in real life and action how mathematical concepts and functions relate to music in a tangible way. If you have read past posts, you know I have a fascination with space travel.The name for this blog, Reach for the Stars, comes from my ideas to connect music and math to the limitless possibilities of space travel. These connections are there and it is possible to make it happen. Launch time! Thanks for the Pingback-great to support our like ideas. Mozart had a natural aptitude for Maths that must explain his musical genius. Music lesson for the children must help develop their analytical skills, not to mention the relationship of rhythm and harmony in their emotional growth.